After the holidays, the state of my house potholders are kind of gross, to say it plainly. 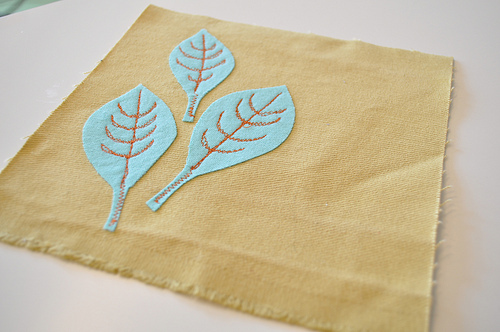 Maybe you are in the same situation, or maybe you want a quick dose of creativity – either way, this fast little applique project is fun and versatile and you can whip them up for host gifts too, at the last minute! 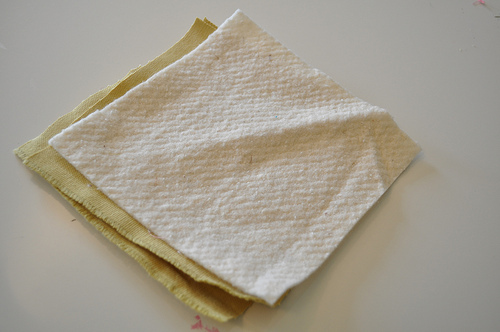 1) You can make these any size you desire, but I had some nice scraps of this golden fabric and I could only make them 7” squares – cute sized. Cut a front and a back piece. 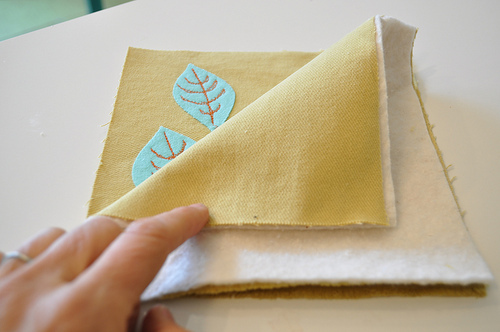 2) Fuse the web to the backside of the applique fabric. 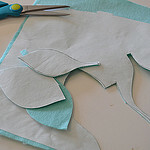 I chose this aqua from my scraps and a nice ice blue for my leaves – of course, it contrasts so beautifully with the gold. 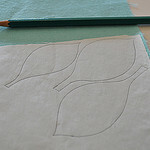 3) Draw your applique shape designs on the paper side of the web. 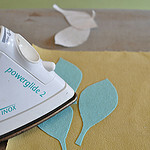 Cut them out, peel off the paper, and arrange them on the right side of your front piece. 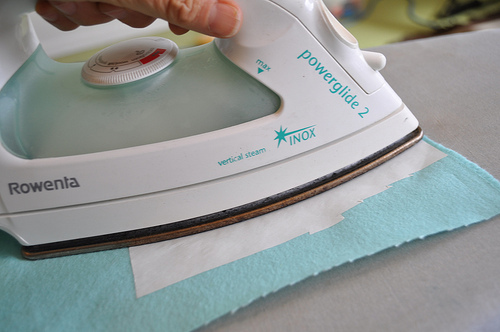 Press with a hot iron to adhere. 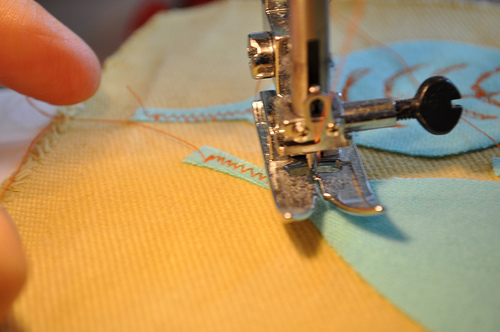 4) Now comes the fun part – stitching the applique in place! I used an orange thread to contrast against the blue and gold. 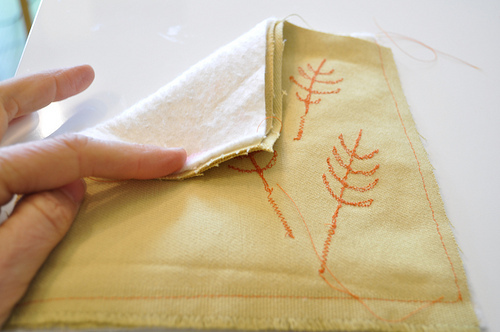 I started at the leaf stem and made a small line of zig zag stitches. 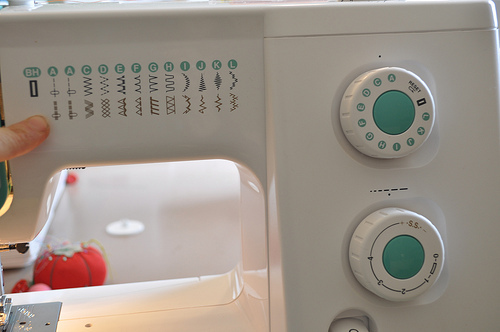 Check your manual if you don’t know where it is on your machine. 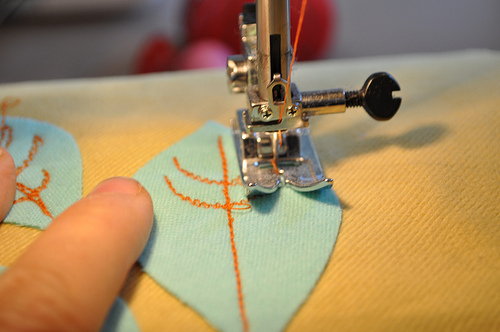 Stitch back down that line about ½” and then pull your fabric to the right so you can lay down an arc of stitches on the left side of the stem vein – then trace that stitch back to the center and arc up on the right side and back. Move down the center vein another ½” and repeat. Do all the leaves in this way (or some other way that you like). 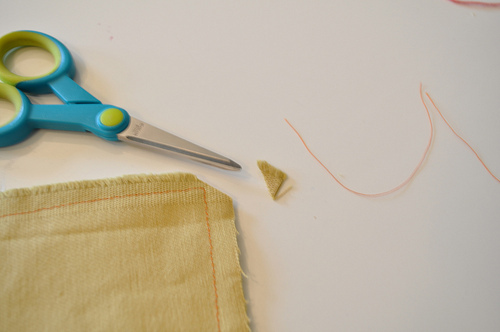 TIP: Practice this first on a scrap piece of fabric. 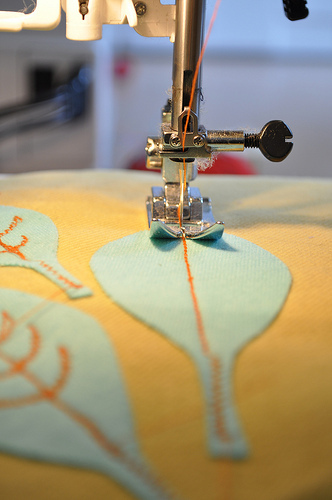 You will really get that needle moving fast and you will move the fabric slowly. 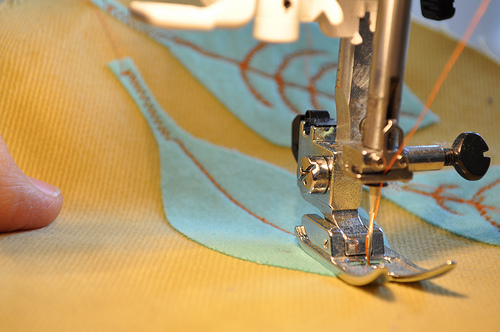 You control where the fabric goes since the pressure has been removed from the foot. Try it out! 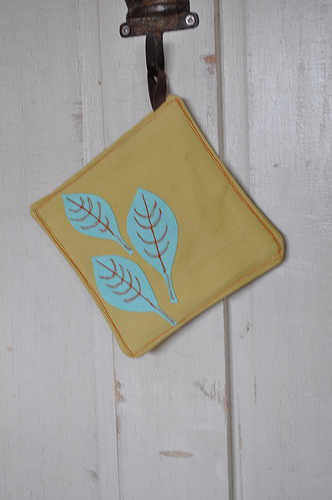 Front and back of potholder with the right sides facing each other, and then the square of batting or wool atop those. 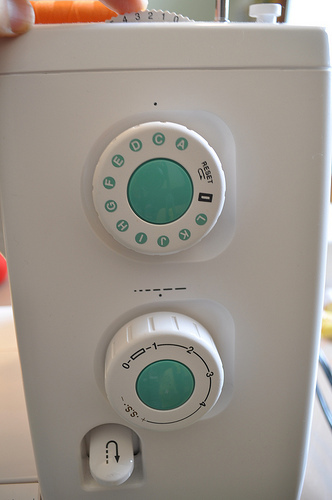 Starting from the top right corner, stitch down, along the bottom, and back up the left side, ending at the top left corner. 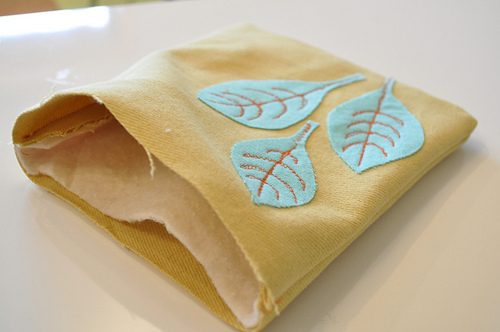 Fold raw edges towards the inside of the bag about ½” and press with an iron. 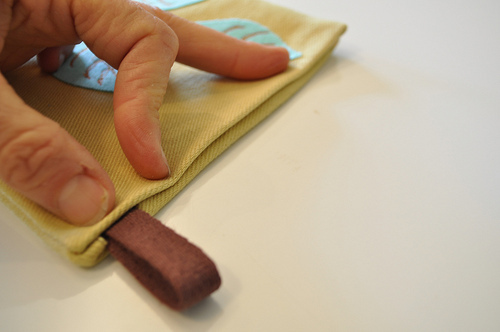 Fold the 4” length of twill tape in half and insert into one corner with the loop facing out. 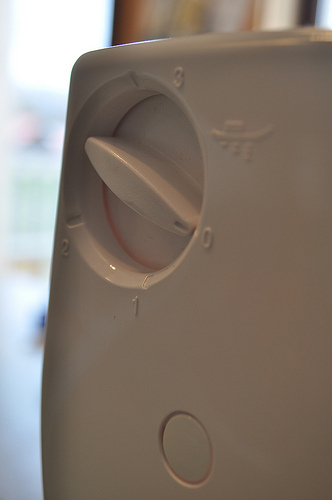 6) Now, if you really feel like it, pin it. Otherwise, just bring it over to the machine and edgestitch along the open edge, and then around the rest of the square. I went around 3 times for fun – yee haw!